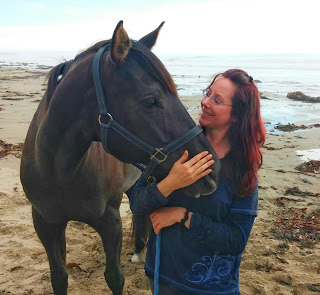 There are energy healing horses hidden all over the world and while I know this, it always surprises me when I meet one!!! 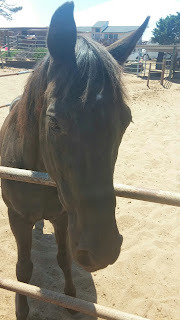 Magic, the gorgeous black Tennessee Walker who is the owner's horse where I am staying on the California coast, is one such hidden gem. And remarkably well-named, because he's a real wizard! While Magic has never been around "the work" or people who understand "the work", it became quite clear the moment I met him, that he was waiting for his opportunity to do "the work!" 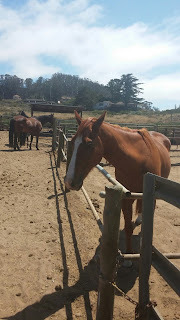 In fact, every time I came by his paddock to swing the gate closed, he'd say, "Let's do some work." And even if I only had a few moments, he'd get started nipping stuck energy off of me, particularly my hands. One day, I finally said, "Ok, let's dive in." And I'll be damned, he actually walked me through just the kind of healing session I would have offered someone else! HA! These horses are so brilliant. He had me still myself and take a few breaths before I scanned my body. "What do you notice?," he asked. "An area the size of a rectangle across my chest," I replied. "Go deeper, how does it feel?," he inquired. "It likes like a vacant space, dark, closed, like the breath isn't moving through there," I replied. In response, Magic took his nose and moved across the rectangle a few times, in clear recognition of the block I had just become aware of. "Um-hmm, and the feeling?," he guided me further inward. I took a deep breath and tuned in deeper, and was surprised to feel a mix of emotions: humiliation & shame first among them. And then a wave of sadness and grief, with the thought, "NEVER again!" Magic responded by placing his muzzle right into my heart and rubbing his lips all over, unlocking stuck emotion, as I began yawning and yawning in release. As we continued, a picture unfolded. Long, long ago, I had a position of leadership, of authority, and somehow, somewhere, people died. It was out of my control. And yet, still I felt responsible and so I VOWED to NEVER AGAIN allow that to happen. To do that, I took a VOW of INVISIBILITY. If people can't see me, then this sort of thing can't happen again, and my light dimmed, my heart closed. As this realization came through, tears began to stream down my face, and Magic continued to nuzzle at my heart space, opening and releasing eons-old stuck energy. Magic's chestnut friend stood in the next paddock, licking and chewing, offering his support for the process. There is safety in invisibility, but it's not always so much fun to dim your light, so once Magic was through nuzzling and nipping old energy from my heart and solar plexus, he offered a great idea. "Why don't you break that vow and call back in all of your power, from all the times and places you left it?," he wisely suggested. "Oh, good idea," I replied, as he stood right in front of me and helped me break the energetic vow that had been placed over my energy field. He continued to work my field, as I called back in my power, with big deep breaths. He'd stop a moment or two to stand back and LOOK me in the eye, SEEING me, sensing the progress. He wasn't going to allow me to continue to be invisible. He could see me from the moment I stepped onto the property! He had a HUGE liquid eye, that looked deep into my soul, with power, not sentimentality. And when we were complete, he sighed, and I felt my shoulders lift and my chest open, easily standing taller, prouder, more powerfully at ease. As he stepped away, off to his feeder in search of any remaining morsels, he replied, "Good, that's a start, we've got lots more work to do!" Indeed! A great many lightworkers have layer upon layer of old vows, of old fears, of old restrictions that come from other times and other places where sharing our gifts often resulted in ending our lives, in many not so pretty ways. Do YOU have an old Vow of Invisibility? The feeling that it might not be safe to share ALL of who you are? A wariness to step out and SHINE your light, SHARE your wisdom, OFFER your gifts? An unexplained FEAR when you think about showing the world exactly Who You Are? Perhaps you too have made yourself small or invisible, hiding in your Safe Space? 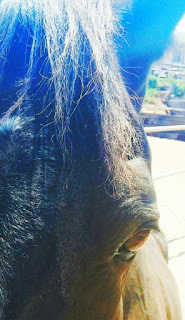 If so, it's time to ask the horses to help you dissolve old Vows made from spaces of fear, whether from this lifetime or others. You'll find them in your body. Let the horses and your heart, show you the way. The world needs you! So show up to your herd or favorite horse healer and start the process of revealing your old Vows, your ancient Agreements, to stay safe. NOW, in this moment, you are SAFE and the world needs your Light, your Wisdom, your Gifts! It's time to be more than visible, but to shine brightly on, as a LightHeart, like a lighthouse, a beacon showing the path forward, in love. The horses are waiting! Let us know how it goes! Please share! What old vows have you discovered? What old agreements are you ready to release? How did the horses help? Please share in the comments below. 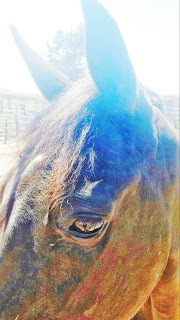 I just love how your horses healed you. I'm still struggling with a desire to be invisible, so I'm going to ask my horse in spirit to help. Thanks for inspiring me to do this. I am 70 lbs. overweight. I hide behind that weight. Men don't bother with women who are fat like me. I am safe being fat. I can't get attacked or hurt by men at this weight. They don't look at me. I am safe and invisible. My horses love and accept me at this weight. Look at how much they weigh. I am puny compared to them. I am ageless and timeless and weightless when I am with them. I am accepted in the herd just the way I am. Oh Jen, you are so right. My invisibility sits in the front of my left hip and the front of my chest where my left shoulder joins my arm to my body. I had felt this but not realised what it was. Now I can open myself to the horses clearing this layer. It is exciting to think what I might be when this layer is dissolved ... Thank you for honouring us with your story. Your story touches me. When I sit with my two horses, one 'does the work' and the other one 'supports' us from a small distance. They always make cry and make me realize which mask I was wearing before that moment and what I truly feel. They are loving friends, always there, just the way they are. I am grateful to share my life with them and grateful for other people who share the same kind of experiences with their horses.